deVine, International Wine Cellars and the Hardware Grill present a special Burgundy wine pairing dinner with Louis Jadot Export Manager Vianney Gravereaux on Wednesday, October 10th. This is a not to be missed multi-course dinner designed by Chef extraordinare Larry Stewart. 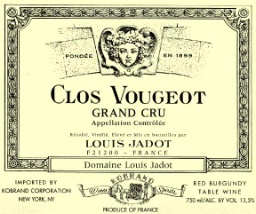 All wines served for dinner will be Premiere and Grand Cru’s with a highlight feature wines being comparison of the stellar 1999 and 2009 Clos de Vougeot Grand Cru. We’re all looking forward to this rare opportunity to taste a wide range of fine wines from this famed negociant. Book immediately to avoid disappointment as only 17 spots available for this sit-down event at the Hardware Grill. Note: Deadline for registration is midnight Monday, October 8th. Due to the special nature of this event in collaboration with the Hardware Grill, we will require 72 hours notice of cancellation for store credit only. No store credit if cancelling inside of 72 hours or missed tastings. deVine Wines Participates in Alberta Culture Days! Alberta Cultures Days 2012 is kicking off this year’s celebration on 104th-Street! On Friday, September 28, 104th-St. will be shut down starting at 7:30am, between Jasper Avenue and 102 Avenue, to jump start the three-day, province wide celebration of Alberta’s culture. deVine Wines is thrilled to be part of this celebration! Come on for our regular WTF (Wine Tasting Fridays) between 4pm and 7pm. The tasting is free of charge, but a $5 donation to our charity of choice, the Zebra Child Protection Centre, would be greatly appreciated. Representatives from the Zebra Centre will be on hand to explain the work they do to assist children in abusive situations. Is there better way to enjoy your Tres Carnales Mexican food experience than to sample it with some locally brewed beer? Edmonton based Alley Kat Brewing Company and Yellowhead Brewery will be on hand to offer you samples of their wonderful beers. Please check out www.alleykatbeer.com and www.yellowheadbrewery.com for more information. Tickets for the Zebra Centre fundraiser are available at the door only for $5 each. Proceeds will be donated directly to an on-site Zebra representative. Only 100 tickets will be sold on the evening of Sept 28, so come early to avoid disappointment. To learn more about the Zebra Centre, please visit their website at www.zebracentre.ca. In preparation for the celebration, 104th-St. will be closed on Friday, Sep 28 beginning at 7:30 AM. From 4:30 to 9:30 PM, 104 Street will be alive with free, family friendly activities including live music from Shout Out Out Out Out Out, Mad Bomber Society, Politic Live and DJ Beat Burglar. The main stage will be located near the intersection of 104th-St. and 102nd-Ave. Throughout the block party, visual artists will be creating and sharing their pieces, while the latest Alley of Lights will illuminate the area. Food trucks and a bannock making stand will tempt your taste buds too. The food trucks will be located on the south end of the street near Jasper Avenue. Plans are underway for some of the 104th-St. restaurants to extend their patios for the event. Please stay tuned for more information. Alberta Culture Days started in 2008 as a one-day event to raise awareness of the importance of culture for healthy communities. The growth and popularity has seen Alberta Culture Days grow to three wildly creative days. All over the province communities host free, family friendly events and activities that showcase Alberta’s arts, heritage and culture. The 104 Street block party will kick-off Culture Days activities being held throughout the Capital City. The 104th-Street community is thrilled to be selected as the site for this kick-off celebration! A big Thank You! to everyone who came out in support of the YWCA’s “Walk a Mile in her Shoes” fundraiser and wine tasting. Together, we raised and donated $1,625.00. Funds will be used for the YWCA’s Family Violence Prevention Programs. Thank you to my fellow male teammates who were brave enough to don a pair of heels to make this event a success. From left to right are Chris Arnold in his black, patent heels, myself Ed Fong in 5 inch, pointy toed Italian Gianrico Mori stiletto pumps, Rick Langlois in mid-heeled strappy sandals (note the painted toe nails) and Dirk Chan in eye popping patent red stiletto court shoes. Not pictured is volunteer extraordinaire Bob Parsons. You guys displayed great sportsmanship and agility! Thankfully, no injuries were reported, except for the residual pain of aching calf muscles the following morning. Donalda, thanks for capturing this wonderful moment in time. We would also like to thank our partnering wine importers who donated all the wonderful vino in support of this event. Bravo to you! If you would like to make a donation towards my continuing fundraising efforts, please click this link: here..
With your generosity, I have now surpassed by personal goal of raising $2,000 for this very worthy cause. Thank you to all who donated their time, effort, encouragement and financial support. Each December, deVine Wines holds two sold out wine tasting events featuring some of the best value driven wines the team has recently discovered. We will be hosting a special session of Best Bang for the Buck tasting on Thursday, September 6th, in support of the YWCA’s Walk A Mile in Her Shoes Campaign. All gross proceeds will be donated to the YWCA in support of their Family Violence Prevention Programs. In the spirit of this fundraiser, Ed Fong, Managing Partner of deVine Wines, will serve wine to you in heels that evening. Ed will be joined by his male co-workers “man enough” to walk in similarly attired footwear. 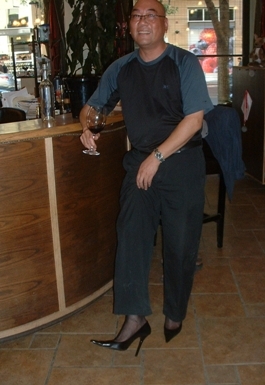 As incentive, those men attending the event in women’s shoes will be offered an additional 2% discount (in addition to our regular 10% tasting discount) off the wines tasted. So please come out and show your support for a great cause. Reservations can also be secured by calling the store at 780.421.9463. Your pledge to me will help me reach my personal fundraising goal of $2,000. If you want to help break the cycle of family violence and help keep women and children safe, you too can register and join the walk at Churchill Square on September 11.